We jumped from the boat and into the blue waters of the Indian Ocean. Within a few moments, a dark looming shape came gliding through the water towards us as our hearts pounded in our wet suits. Our eyes grew wide at the shape taking form in front of us, as it swam closer. In amazement we watched as the huge Whale Shark with it’s white spotted, grey body swam right beside us. We started to swim alongside but all too soon it’s powerful fins propelled it into the distance and away into the depths. Awestruck we clambered back on board our boat, dizzy with adrenaline and joy. Over a week earlier we’d left Perth on our journey North with the Indian Ocean on our left as a constant companion. 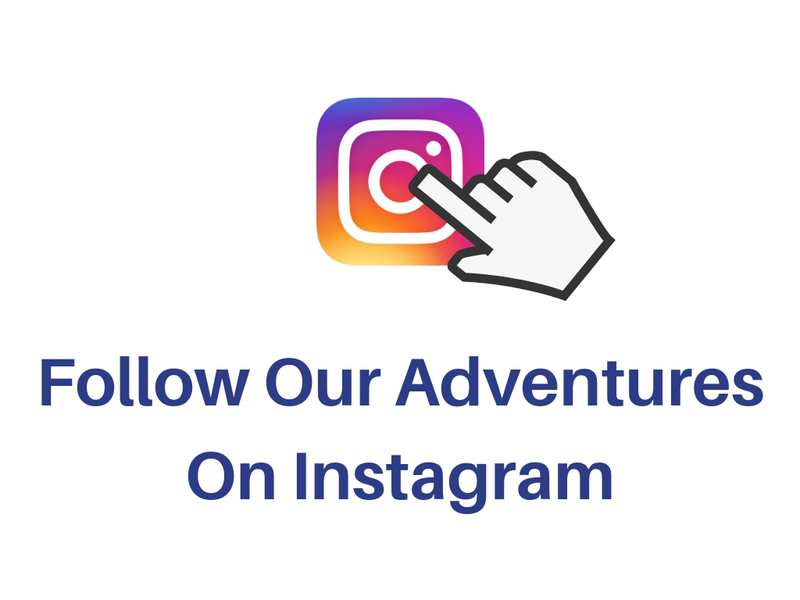 After spending six weeks house and cat sitting in Padbury, Perth, Western Australia it was time to set out on our road trip adventure around the Western half of this huge and diverse country of Australia. Our budget was low and we’d only been able to rent the smallest camper van in the range. It didn’t have a bathroom but it did have a two ring gas hob, a small sink and water tank. A small seating area transformed into a bed for two people and a third person could sleep up in the roof space on a temporary platform. We loaded our belongings on board and set off up highway 60 Northwards. A very loose plan of travel had taken shape in our heads but as we didn’t know how far we would get up the West coast, it would be very flexible and open to change. The three of us sat along the front seats as we set off with the gorgeous blue Indian Ocean on our left. Leaving our housesit behind we drove down to a viewpoint overlooking the ocean where we looked out over the beautiful Indian Ocean. The sky was bright blue and we were ready to undertake our road trip adventure. It was already well into the day so we knew we wouldn’t get too far along the road, so we headed off along the coast for Yanchep National Park. 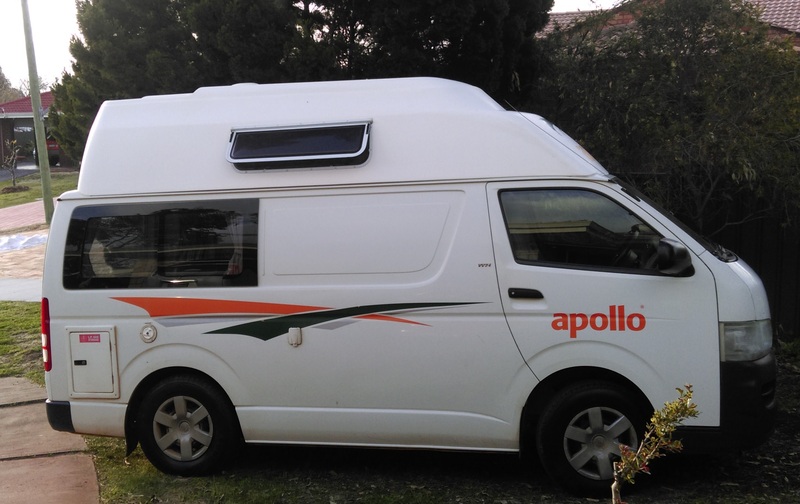 Yanchep was only about half an hours drive North but we wanted to have a short day as we didn’t have a daily routine yet and wanted to get used to campervan life. 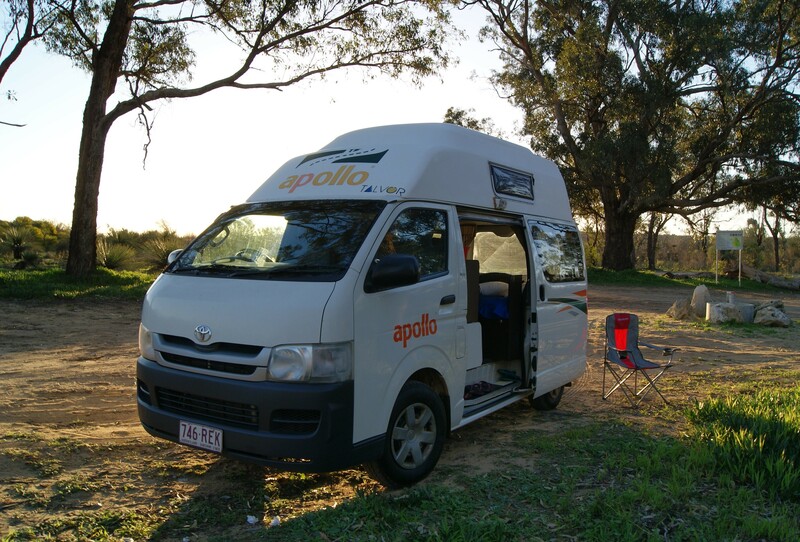 It felt good to be on the road and soon enough we were parking in the Yanchep National Park. 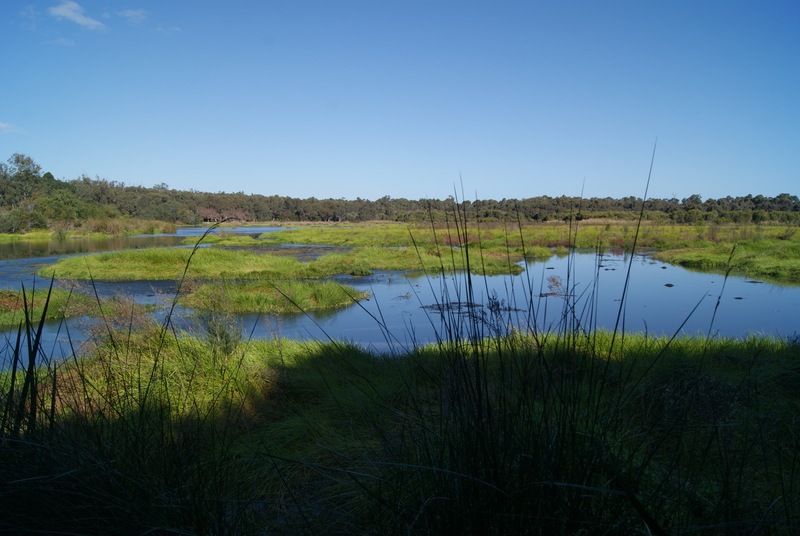 Large grassed areas gave way to marshes surrounding a lake and as we walked we heard the sound of Kookaburras in the trees. A group of Kangaroos grazed on the grass oblivious to us as we took some photos. 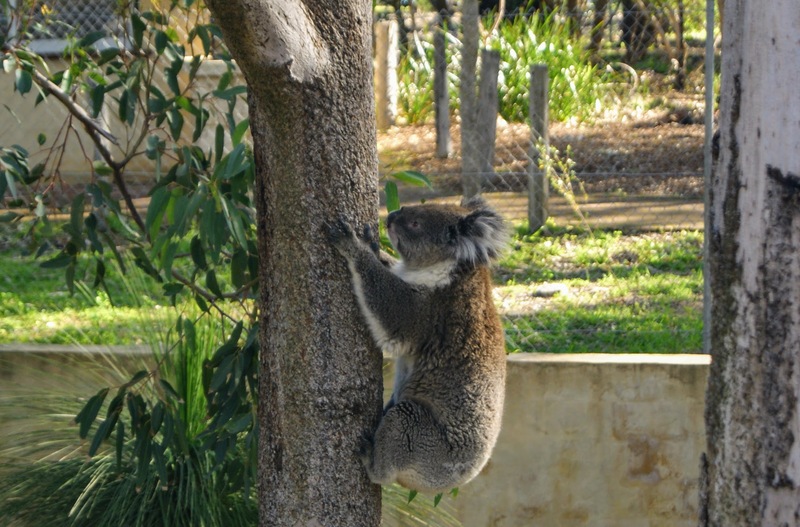 Koala bears are the iconic mammal of Australia but aren’t native to Western Australia, luckily Yanchep National Park has a thriving community of Koalas that can be viewed from a raised boardwalk through the Eucalyptus trees. We marvelled at these wonderful animals clinging to branches of the trees and walking across the ground. It was a first for us as well as Annabel and it was hard to tear ourselves away but as it was getting late and we didn’t have anywhere to camp yet, we needed to hit the road. 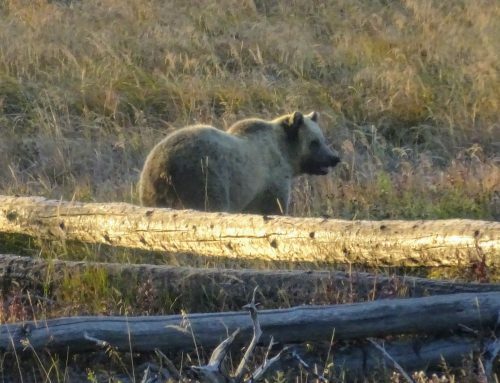 In a stroke of good luck, we spoke to one of the Park Rangers who asked where we were planning to camp. We could stay at the Park for a fee but she suggested something that we came to rely on for the rest of our trip, an app called Wikicamp. She told us about an area just North of the Park where we could camp for free. We downloaded Wikicamp as soon as we were able and it proved invaluable. If you haven’t heard of it before, it’s an app that you can use offline to show you places where you can camp for either a fee or free. It also shows all amenities in an area, such as day parking, bathroom facilities, wild camps, truck stops, day time shower facilities and a whole host of other useful things. After a short drive, we found the camping area and set ourselves up. Several other campers and four-wheel drives dotted the area but we found ourselves a quiet spot where we prepared a meal and settled in for the night. We awoke after a freezing night, actually, the temperature inside our camper had dropped to freezing so we hoped things would warm up as we headed further North. A quick wash at our sink and we were back on the road. Initially, the road took us away from the sight of the ocean but soon we were right back beside the turquoise Indian Ocean again. 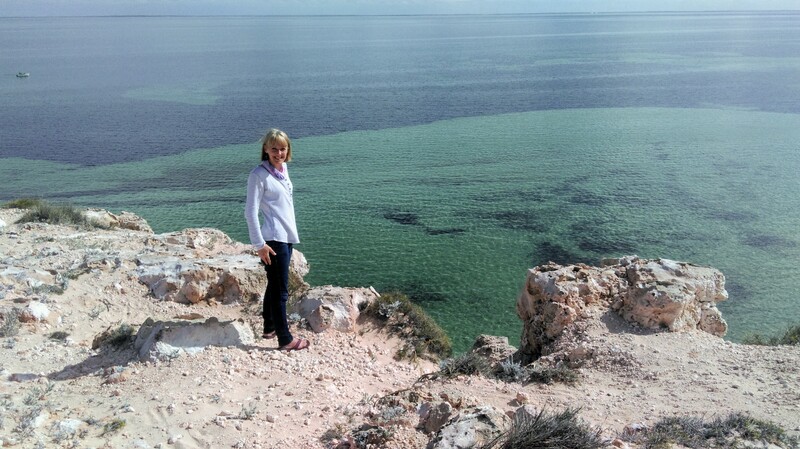 We made our way up the coast to Jurien Bay, a small town right on the coast. We were ready for some beach time, so we parked near to the shorefront and made our way along the boardwalk to the white sand beach. A small play park was situated just on the beach which gave Annabel a chance to get some exercise and have some fun. 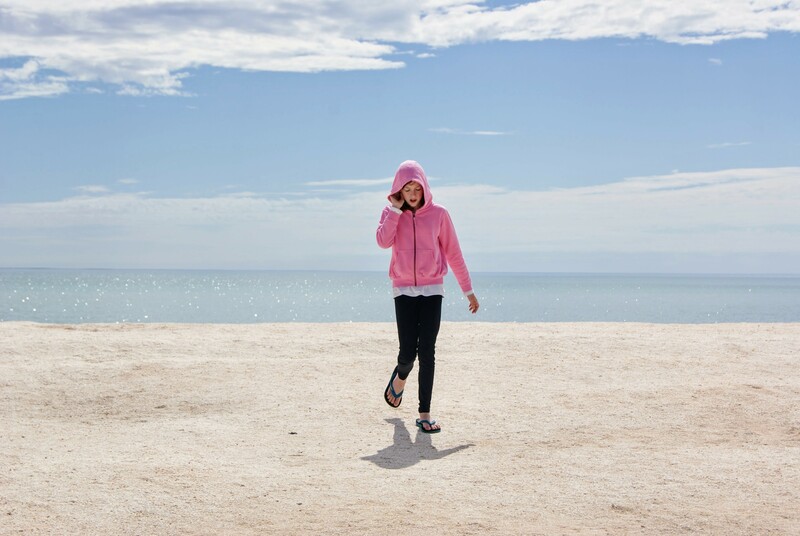 We strolled along the beach taking in the wonderful views out to sea and along the shore. These were beaches we’d only ever dreamed of and here we were with the sand between our toes and Annabel running in the water. We took a walk out on to the short pier and decided it was time to push on to find somewhere for the night. 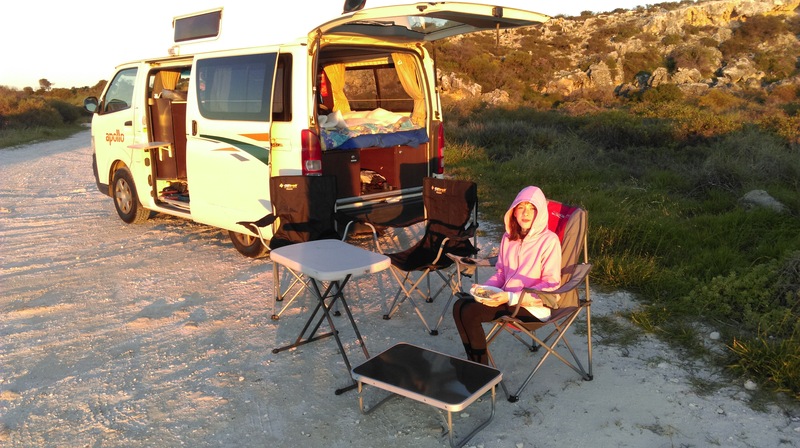 Just North of Jurien Bay, Wikicamps told us there should be some wild camping opportunities near the beach. After a short while, we found the turn off onto a dirt track which took us towards the ocean and some camper parking areas. We drove past the main area but further on found a track we could park on that was more or less right on the beach. This wild camping was amazing so far. We walked along the beach taking in where we were and what we were doing, which seemed somehow like a dream. Our view was stunning as we prepared our dinner and set our seats out to watch the sunset. Road tripping in Winter meant shorter days and having to end our days drive rather early but it was good to get settled in somewhere and then get early starts in the morning. We drifted off to sleep with the gentle sound of the ocean just meters away from us. Waking to the view of the ocean from our camper window was magical. We had breakfast and prepared to start our days drive North. Staying here had been so amazingly beautiful and I know we left a piece of our hearts there. Our route kept us hugging the shoreline with the ocean never far away. We drove through Dongara and carried on toward Geraldton the largest town we’d visited since leaving Padbury. Once we arrived in Geraldton we soon made the decision to carry on North and just use the town as somewhere to stock up on supplies. As we were wild camping, we obviously couldn’t hook up to any mains to keep our refrigerator cold so any meat we wanted to store had to be eaten within a couple of days of purchasing it. We found a supermarket and bought what we needed for the next few days then filled up on fuel at the nearest fuel station. 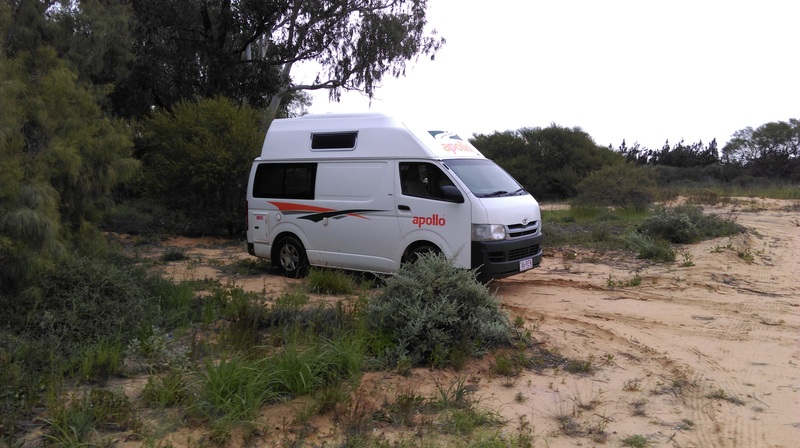 Heading back out of town was kind of a relief as Geraldton didn’t feel like the best of places to stay longer and besides, we wanted to get back to the remoteness of the countryside. 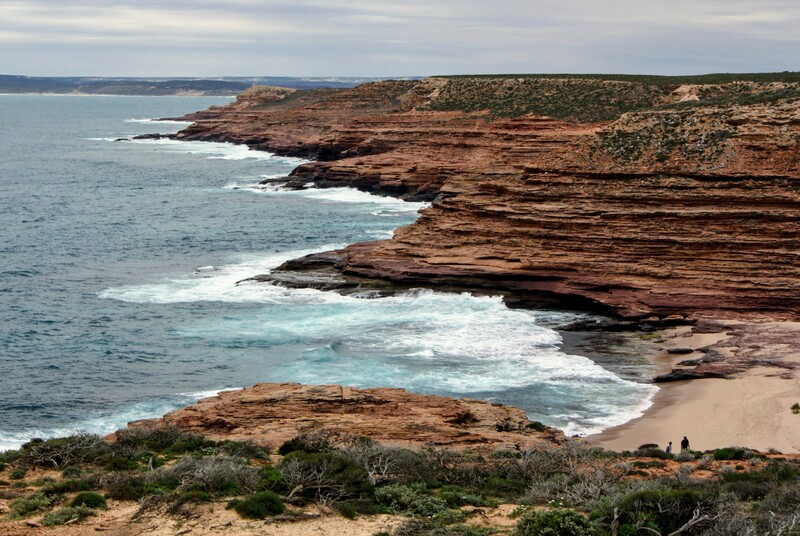 We had now joined Highway One which headed inland but we soon turned left onto a smaller road that would take us back to the ocean and on to Kalbarri. Kalbarri is a very small settlement right on the waterfront but before we got there we stopped at Kalbarri National Park ( which, by the way, is huge ) to see the rock formations of the coast. We turned onto a side track which led us to a parking area from which we set out on foot. 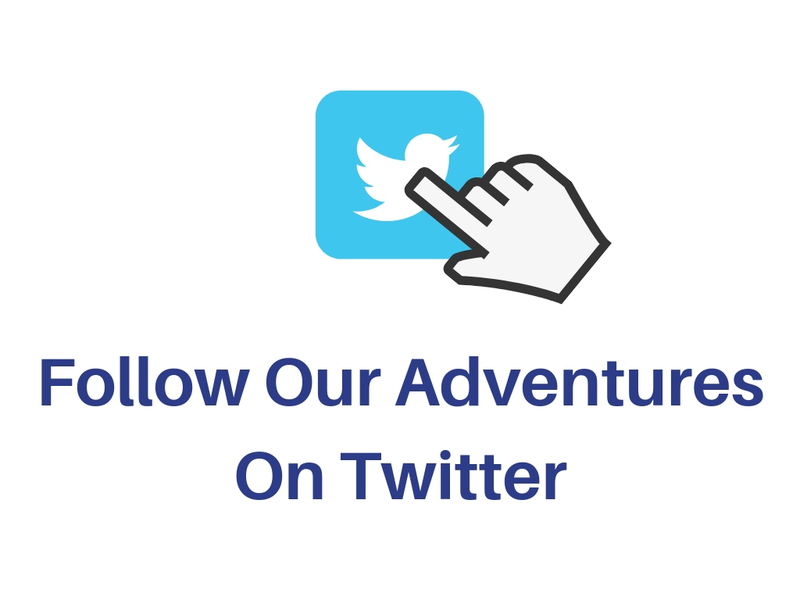 There are lots of trails to follow that take you past the wonderful weathered rock coastline and secluded sandy beaches. The ocean has smashed against the shore in a process that has worn the rocky coast down over millennia. We still had a long drive to the next wild camp that was near to Ajana. 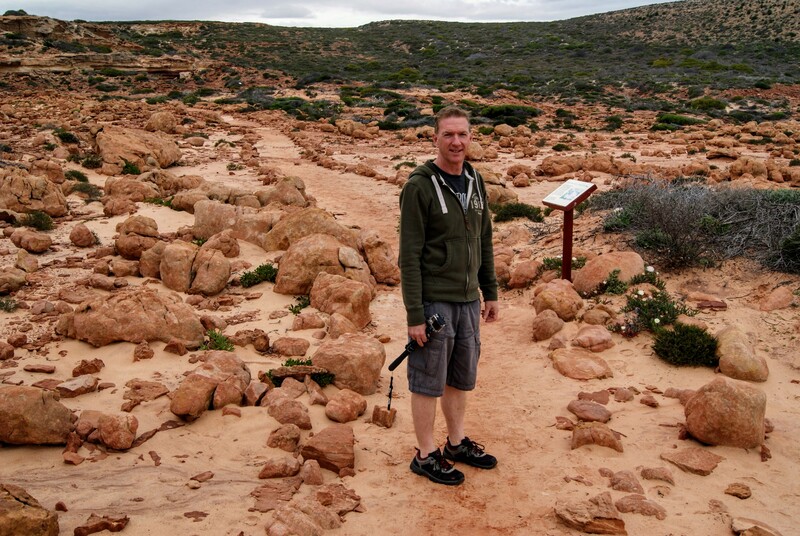 As it was late in the day we turned East through the heart of the Kalbarri National Park. It was dusk by the time we arrived at a very small but secluded parking area in amongst some trees. There was another camper parked up so we found a free spot and settled into the routine we had now developed. After getting on the road early, we rejoined the main route North, Highway One. 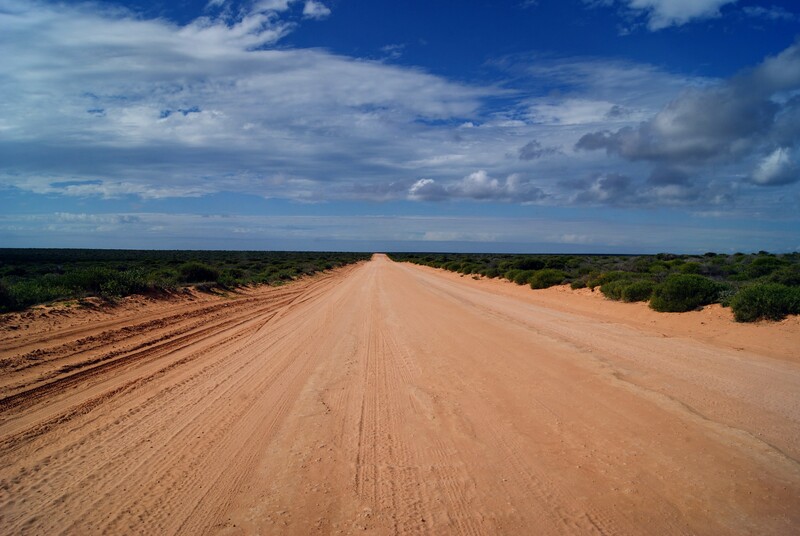 This area of Western Australia is very remote and you can drive without seeing any other cars for miles and miles. 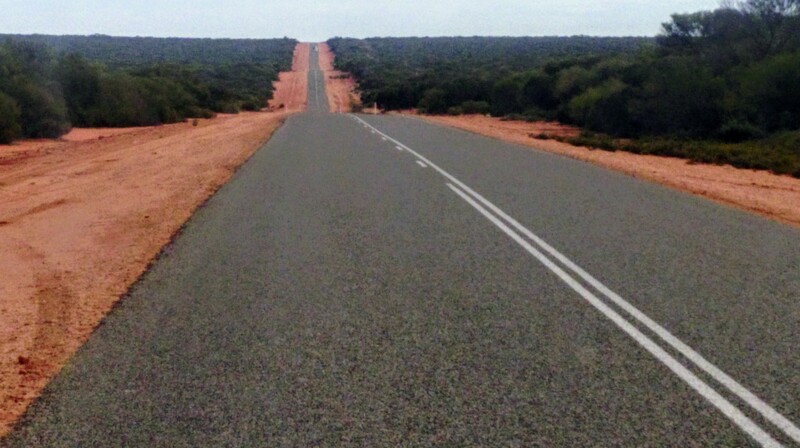 As we drive, all we can see in any direction is endless red earth and bush, with no sign of life. 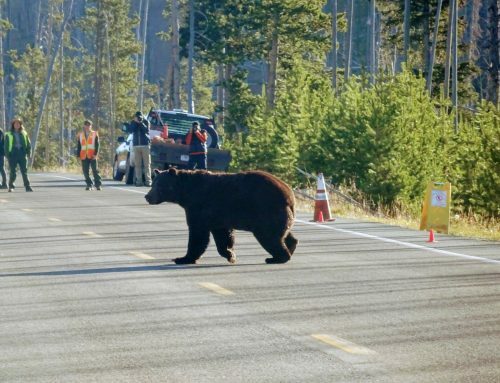 We really got an idea of how people can get lost out here really easily if they were to walk away from their vehicles. 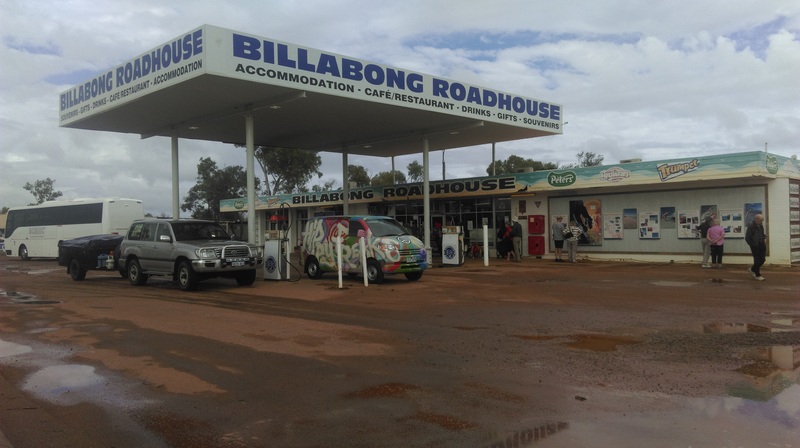 After a couple of hours drive, we came upon the Billabong Roadhouse, the only stop for fuel and supplies within hundreds of miles. The Billabong Roadhouse has become somewhat of a legend and sells its own merchandise. You can stay here in the motel or camping facilities but we chose to have a look around their shop and restaurant, fill up on fuel and drive on Northward. Further North we turned left off of the highway and drove toward the coast and Denham. It’s hard to explain just how remote you are out in this area. 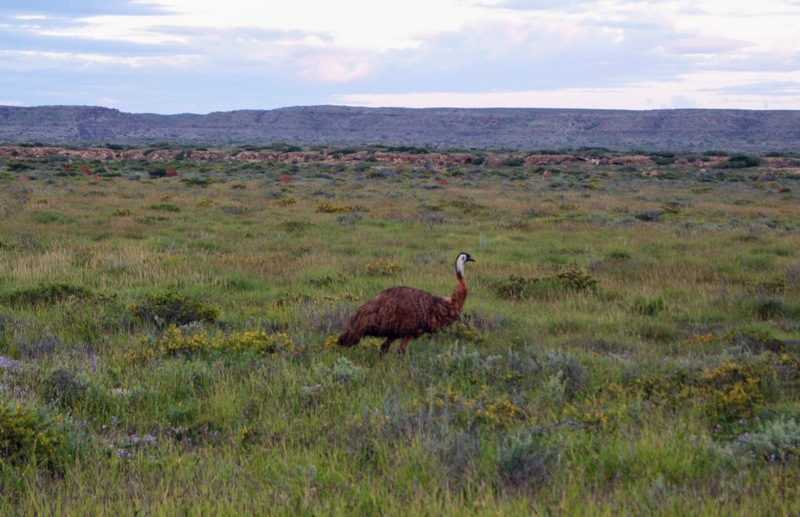 We spotted some kangaroos by the side of the road and termite mounds dotting the landscape. Our route now turned North again as we headed up a peninsula of land with the ocean to either side of us. A sign to Shell Beach directed us to turn right into a parking area and from there we walked out onto the most glorious beach. It’s a huge, stunningly white beach with beautiful clear calm waters lapping at the crescent shore. The first thing we noticed as we stepped onto the beach was that it’s crunchy underfoot and not sandy. 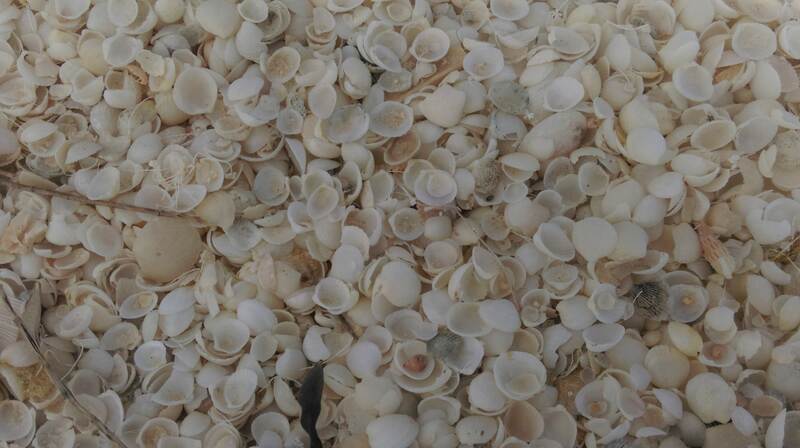 It’s one of only two beaches in the world made entirely from shells and runs for a length of 37 miles. We paddled in the shallow, crystal clear water along the shore before heading back to our van and onward. We headed towards the West coast and Eagles Bluff. At first, we drove along a surfaced road but soon left it for a 3 mile stretch of unsurfaced track. That was the longest 3 miles of our lives as the track was rutted so we had to drive very slowly as to not shake our poor camper van apart. At last, we arrived at a highpoint parking area overlooking the gorgeous turquoise waters of the Denham Sound. We even got to see a ray of some sort swimming close to shore. It was a beautiful walk under the clear skies. We couldn’t relax as we knew we had the same horrendous drive back along the track we had arrived on. After reaching the main road again we headed for the town of Denham. We reached the town of Denham by mid-afternoon but as we entered, a group of policemen stationed by the side of the road, waved us down. The police officer asked me to do a breathalyser test which I thought quite strange at this time of day but the officer told us we’d be surprised how many people they catch early in the day. This was the first time I’d ever had to do a breathalyser test and it was quite strange and nerve-wracking considering I don’t drink. Denham has a Discovery Centre with a visitors information desk, so we made a stop there to ask about somewhere to camp for the night. The lady informed us that there were no wild camping spots on the peninsula but we could pay a small fee to camp at one of the spots on the coast within the conservation area. There are four camping areas and only four vehicles allowed on each site so we were very lucky that there was one spot left at a place called Fowlers Camp. Backtracking our way down the coast we found the turnoff to Fowlers Camp and drove along the rough unpaved track. Soon we found ourselves by a beautiful horseshoe-shaped bay. We found a great spot right by the water’s edge and settled in for the evening. The place is idyllic and although there were three other vehicles there, we were all spread out around the bay and would hardly know each other were there. 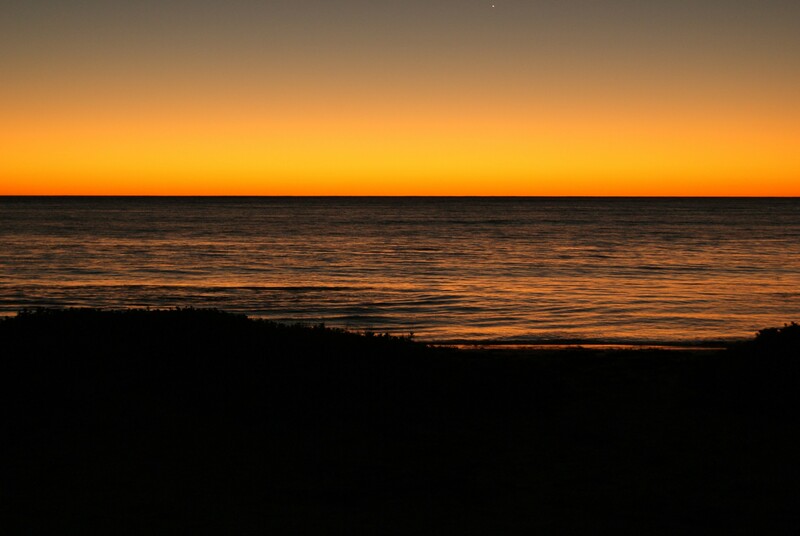 As we sat and watched the sunset we noticed a small ray swimming close to shore. That was probably the best site we camped at through the whole trip. We sat eating dinner overlooking the calm waters of the bay, not a sound to be heard except the gentle lap of water on the shore and a sunset that made our hearts melt. We awoke to the beautiful view from our campsite. It was early and we had a long drive ahead of us, little did we know how long it would turn out to be. We got on the road early and headed back the way we’d come to join Highway One, North again. There was little to see with endless miles of nothingness all around us. To pass the time we lip-synched to Taylor Swifts, Shake It Off amongst other songs and had quite a laugh. We left Highway One and continued on towards Coral Bay. Five and a half hours later we reached the tiny settlement of Coral Bay but were amazed to find the place heaving with people. The campsite we were hoping to stay at that night was full. So with nowhere to stay nearby, we carried on North and into the evening. The last thing we wanted to do was drive in the dark but there was absolutely nowhere to camp in this area. We decided to just keep driving toward Exmouth, our next destination. Wikicamps showed us a lay-by area an hour or so from Coral Bay, where we could stop. As the light faded we spotted the parking area which was really just a large lay-by and pretty full of campers of all shapes and sizes but we managed to squeeze into a spot and settle in for the night. First thing in the morning we were off and on our short drive to Exmouth. 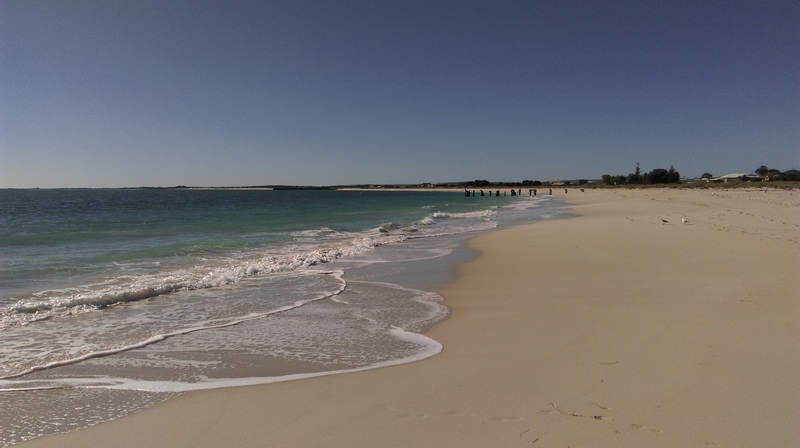 Exmouth is a fair sized community on the Eastern coast of Cape Range. 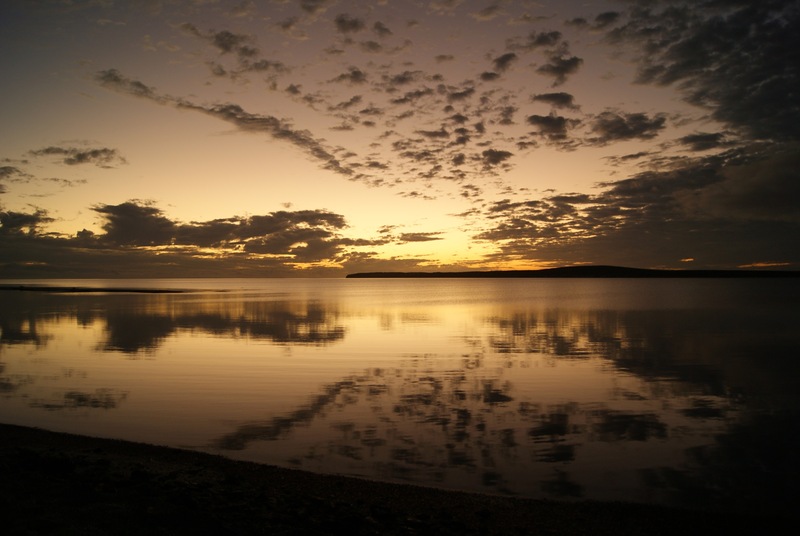 We visited the tourist office and came across information on Kings Ningaloo Reef Tours. 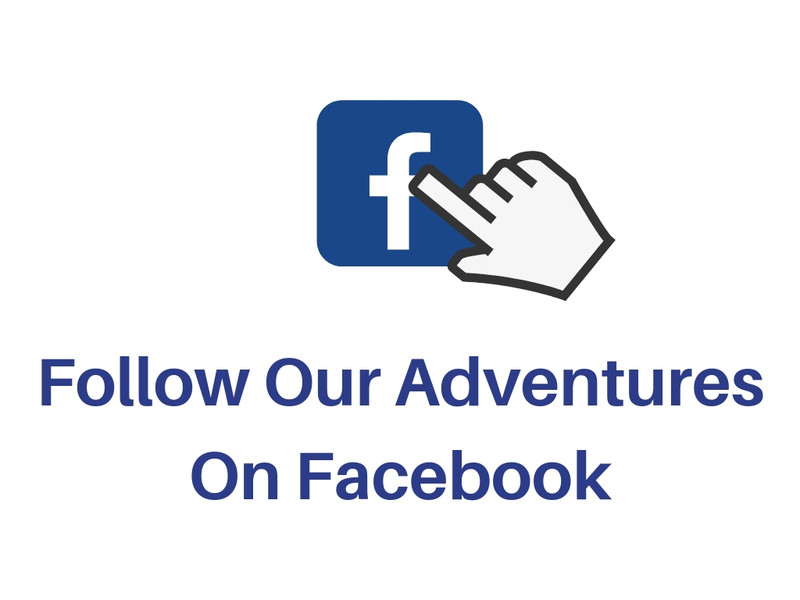 We asked them all about their tours out onto the Ningaloo Reef to see Humpback Whales and Whale Sharks. After a lot of thought we booked on to their Whale Shark Tour for the following day. The tour was one of the most expensive things we had done but hopefully, it would be worth every Australian Dollar. 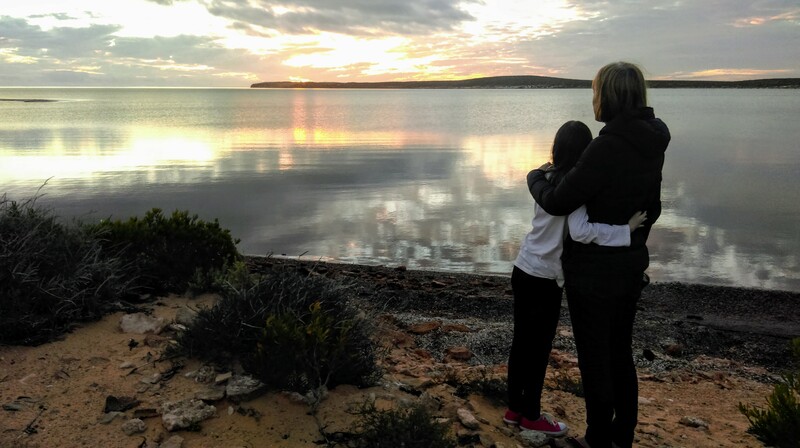 They also helped us book into the Ningaloo Lighthouse Caravan Park which is a fifteen-minute drive out onto the West Coast. Once we had booked into the caravan park, we drove further South along the coast to check out the beaches. After quite a drive we found a beautiful beach that we’d been told was great for snorkelling. The water was fairly calm and the beach covered in stunning white sand. Annabel and I went into the water a saw lots of fish swimming around us. We made the most of our beach time and then drove back to the caravan park. Along the way, we spotted a Dingo by the side of the road. 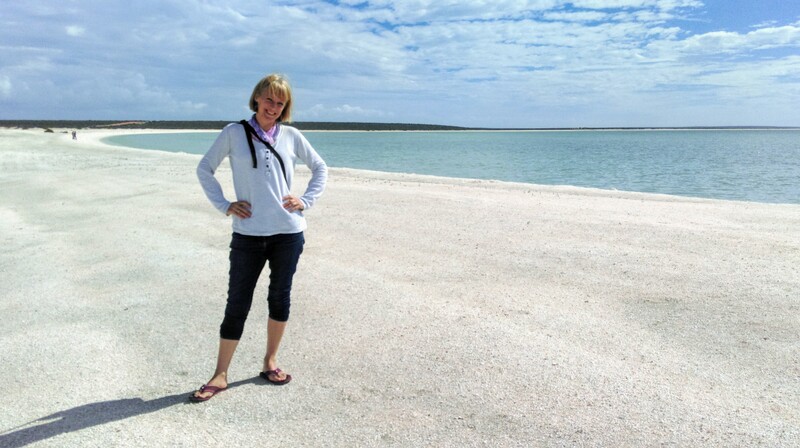 We were picked up early in the morning to be taken to the boat that would take us out on to the Ningaloo Reef. The crew spotted whale sharks and we made our way to them. All three of us got to be in the water with the Sharks and it was one of the most thrilling experiences we’ve ever had as a family. 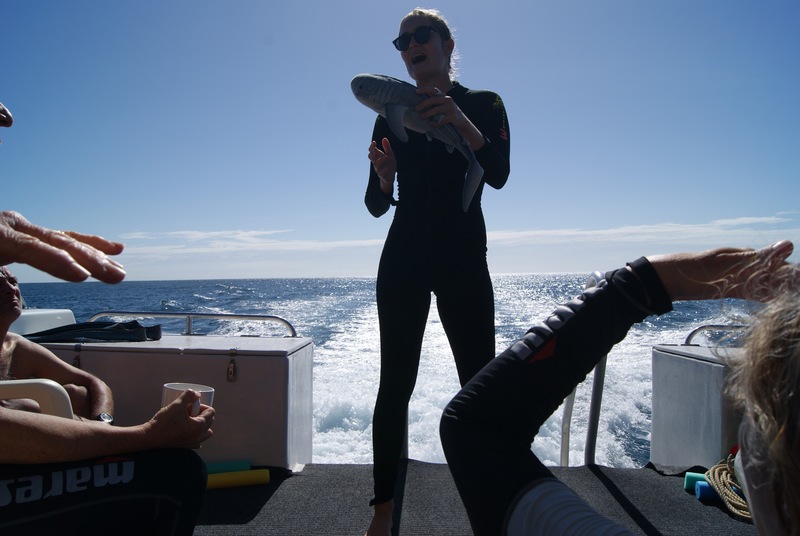 The crew onboard the Kings Ningaloo Reef Tours boat were amazing and helped Annabel with swimming in the deep water and showing here everything on the reef. The Ningaloo Reef is actually more pristine than the Great Barrier Reef and we saw some beautiful fish and sea creatures during our day out. 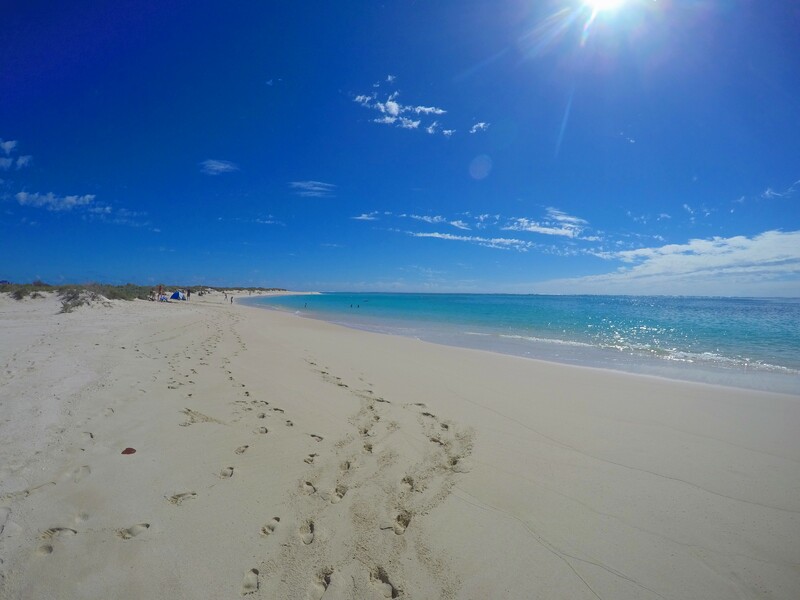 Our experiences out in the ocean warrant a longer article, so, you can read an in depth blog about our Ningaloo Reef adventure here. What a day we had. The memory of this day has stayed vivid in all our minds. We got to see Humpback Whales, a Tiger Shark ( from the boat, luckily ) and all manner of sea life. Once back on shore and after being dropped off at the caravan park, which had been kind enough to let us park out front in their parking lot, we left the Exmouth area and headed back South along the only road out. It was quite late so we decided to stay the same lay-by as when we came in. It was busy again but, we made a space for ourselves and bedded down for the night. We had a big day in front of us as we wanted to reach the small town of Tom Price just outside of Karijini National Park. With a big change of direction, we’d now be travelling East inland and away from the coast. The flavour of our road trip was about to change. 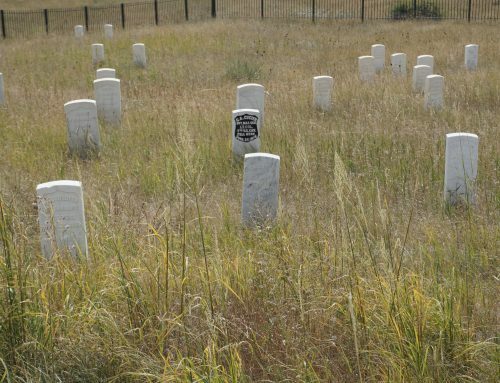 Ahead of us lay huge national parks, tiny settlements, ghost towns, gold prospectors and the biggest gold mine in the country. 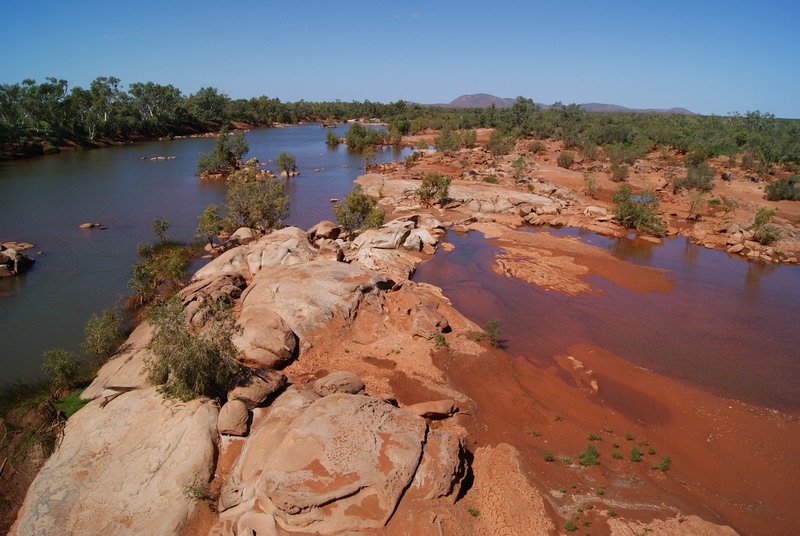 We were about to immerse ourselves in the Western Australian backcountry.